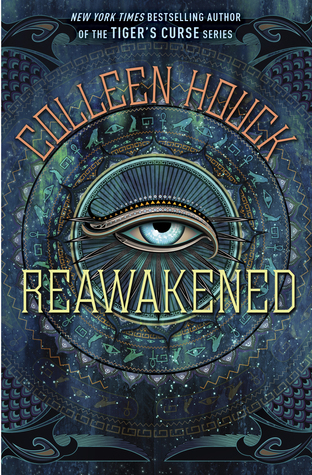 I am a big fan of Colleen Houck's Tiger's Curse series of books which delved into some Hindu and Chinese mythology. I thought it was an interesting story about brothers and this love story between a girl and a tiger shape-shifter. With than in mind, I was very excited to learn that Colleen Houck would be starting a new series of books that begins with Reawakened based around Egyptian mythology. Unfortunately, I wasn't as taken with this story, these characters or the relationships that were introduced in Reawakened. This story begins with Lily at a museum in New York City in which she is drawing in a closed section of the museum and comes across Amon, a mummy and the descendent of an Egyptian god who is reawakened after 1,000 years in order (with his two brothers) to perform a ceremony that will hold off the god of chaos and save the world. In a nutshell. To begin with, I didn't feel like I ever connected with the main character, privileged American girl, Lilliana Young. Her voice was grating and whingey in the beginning and I never really saw any development to her character and I couldn't particularly describe any defining character traits of hers. She does talk frequently about her image and clothing and her in relation to guys and I found it all a little frustrating. Several times she is rejected by the main love interest and asks herself 'maybe I'm just not pretty enough?' One of my biggest problems with Reawakened is how often Lily sees herself as a weak, unimportant girl compared to hot, powerful demi-god, Amon. And I wanted to scream. I also thought the pacing was off. There were many times throughout this story in which there is a moment before something really dangerous or thrilling in which Lily (and the reader) is subjected to an info-dump and the characters all have this lengthy conversation about mythology and a history lesson on Egyptian gods or some aspect of Amon's personal history. And throughout I was thinking 'there are zombies/monsters trying to eat you right now, is this really the right time to give us this load of information?!' I just could not believe that Lily or anyone would calmly take part in such dull conversations in such a time of peril. It just didn't seem realistic. What also didn't seem particularly realistic was the romance. I didn't really believe in Lily and Amon and I wasn't rooting for them either. There just wasn't any chemistry between them, for me. I think the problem was that Lily didn't have enough of a personality and Amon wasn't far too nice and it was as if the idea of Amon was trying too hard to be the ideal guy/perfection. Perfection is utterly boring. And while Lily was intent on telling us of his good looks and hard abs (during another life-threatening situation!) I just wasn't feeling it. I want more than a pretty face. I think after reading the Tiger's Curse series, I was thinking that perhaps even if everything else was disappointing at least there would be an interesting dynamic between Amon and his two brothers? Unfortunately there wasn't enough of the three of them together to make any kind of impact. This book is the first in the series, so I'm guessing that will be explored more in future books. This review is a lot more negative than I intended. I rated this book three stars because despite my many frustrations with the book, I did finish it and there were certain aspects of the book that I found interesting. I was just very disappointed on the whole and I wanted so much more from it. I wanted the mythology to be more seamlessly interwoven into the narrative. I wanted Lily to be a stronger presence in the story. I wanted the love story to take a backseat to other relationships, in particular the relationship between brothers. I probably won't be continuing this series. Awww, this is such a shame - I love the Tiger's Quest series - I'm still reading my way through it so get your disappointment that this one hasn't quite met expectations! Yes, what a shame. Perhaps you'll enjoy it more than I did though? !